Within a week of the budget, RBI issued draft guidelines for setting up small banks and payment banks. RBI in its guidelines said that both payment banks and small banks are ‘niche’ or differentiated banks, with the common objective of furthering financial inclusion. Following are some of the conditions which are common to both the banks as collated by Motilal Oswal. Entities other than promoters will not be permitted to have shareholding in excess of 10 per cent. The purpose of the small banks will be to provide a whole suite of basic banking products such as deposits and supply of credit, but in a limited area of operation. The objective for these Small Banks is to increase financial inclusion by provision of savings vehicles to under-served and unserved sections of the population, supply of credit to small farmers, micro and small industries, and other unorganised sector entities through high technology-low cost operations. Resident individuals with 10 years of experience in banking and finance, companies and Societies will be eligible as promoters to set up small banks. NFBCs, micro finance institutions (MFIs), and Local Area Banks (LABs) can convert their operations into those of a small bank. Local focus and ability to serve smaller customers will be a key criterion in licensing such banks. Branch expansion: For the initial three years, prior approval will be required. The area of operations would normally be restricted to contiguous districts in a homogenous cluster of states of union territories so that the Small Bank has a ‘local feel’ and culture. However, if necessary, it would be allowed to expand its area of operations beyond contiguous districts in one or more states with reasonable geographical proximity. The bank shall primarily undertake basic banking activities of accepting deposits and lending to small farmers, small businesses, micro and small industries, and unorganised sector entities. It cannot set up subsidiaries to undertake non-banking financial services activities. After the initial stabilisation period of five years, and after a review, the RBI may liberalise the scope of activities for Small Banks. The promoters’ other financial and non-financial services activities, if any, should be distinctly ring-fenced and not co-mingled with banking business. A robust risk management framework is required and the banks would be subject to all prudential norms and RBI regulations that apply to existing commercial banks, including maintenance of CRR and SLR. In view of concentration of area of operations, the Small Bank would need a diversified portfolio of loans, spread over it area of operations. The maximum loan size and investment limit exposure to single/group borrowers/issuers would be restricted to 15 per cent of capital funds. Loans and advances of up to Rs 25 lakhs, primarily to micro enterprises, should constitute at least 50 per cent of the loan portfolio. For the first three years, 25 per cent of branches should be in unbanked rural areas. Objective of payments banks is to increase financial inclusion by providing small savings accounts, payment/remittance services to migrant labour, low income households, small businesses, other unorganised sector entities and other users by enabling high volume-low value transactions in deposits and payments/remittance services in a secured technology-driven environment. Those who can promote a payments banks can be a non-bank PPIs, NBFCs, corporate’s, mobile telephone companies, super market chains, real sector cooperatives companies and public sector entities. 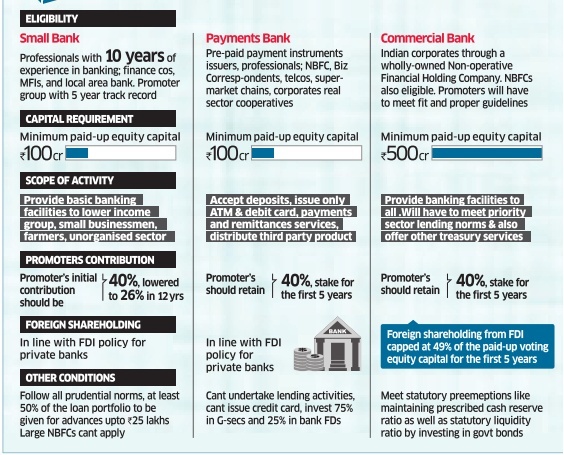 Even banks can take equity in Payments Banks. Payments Banks can accept demand deposits (only current account and savings accounts). They would initially be restricted to holding a maximum balance of Rs 100,000 per customer. Based on performance, the RBI could enhance this limit. The banks can offer payments and remittance services, issuance of prepaid payment instruments, internet banking, functioning as business correspondent for other banks. Payments Banks cannot set up subsidiaries to undertake NBFC business. As in the case of Small Banks, other financial and non-financial services activities of the promoters should be ring-fenced. The Payments Banks would be required to use the word ‘Payments’ in its name to differentiate it from other banks. No credit lending is allowed for Payments Banks. Sri Ram IAS economy notes – Ramesh Singh economy. Highlights of Economic Survey 2013-14 and PDF’s. Why does Raghuram Rajan think that 1929 type of Crash could recur soon?